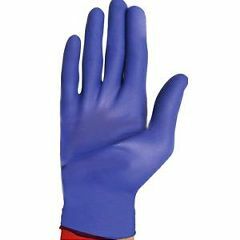 Cardinal Nitrile Powder-Free Exam Gloves have a soft compound for easy fit and comfort over a long period of time, without compromising integrity or strength. These gloves are blue with beaded cuff for easy donning. There's a slight odor to them but they FIT and they stand up to the job! I was impressed with the fast delivery!!! I ordered three items on Wednesday, the gloves were at my door on Thursday and the other two items were here on Friday! Good gloves, but . . .
Caregiver. Provide for my wife. They are good and sturdy gloves but, try as I might, I cannot get them in a size that fits. Comfortable. Good Fit. Versatile. Lightweight. Safe. Easy Storage. Good Fit. Comfortable. Easy Storage. If you are using powdered latex gloves, then switch. I ran out of my usual powdered, latex gloves and decided to try something different. Boy, am I glad I did. They fit well, they not hot and bothersome and they don't rip like my old gloves! What is the thickness of your nitrile gloves? My Mom is in Senior Living and gets extra assistance getting in and out of bed. The girls there are super gentle but once in a while my Mom's skin will tear because of the gloves the girls use while lifting her legs into bed. Is there any type of cloth glove they could use instead of vinyl or rubber gloves? Thank you! I don't believe cloth gloves would be an item furnished to caregivers at an assistant living facility as they are too expensive. One option might be to have the caregiver use a little vaseline or lotion on the Nitrile gloves, then lift your mother's legs into bed. This would prevent the gloves from sticking to her skin. Another option would be to have the caregivers use a soft hand towel in a sling-like fashion to lift her legs into bed. This way, the Nitrile gloves would not come into contact at all with your mother's skin. Not sure ... sorry! There should be some available though. My parents have used a very thin cotton glove in their workplace a few years back. I have never used cloth gloves myself. Perhaps if the girls use powder on the gloves after they put them on it might help not to grab your mom's skin. I had the same problem with my mom. We found the best way to stop the skin tears on the legs is to lift by the heel or bottom of foot. The skin on the foot is much tougher and will not tear as easy. Invacare Powder-Free Vinyl Exam Gloves-- ISG421VF2. Cloth doesn't protect patient or caregiver and can tear skin more easily. The older a person is, the more fragile their skin becomes. I am a nurse. I have never seen a cloth glove, but it is a very good idea for a person with fragile skin. If you supplied some finely knit winter gloves or plain work gloves with no extras (I have seen then in home improvement stores) for the workers to wear over there latex gloves, I am sure that would work. You could launder them at home. If she does not have any wounds on her legs or any communicable diseases there is no reason for the workers to even wear gloves when getting her out of bed. Also knee socks or long knit cable tights may also work. Good luck to you and your mom. In my opinion it's not the gloves, it's the caregivers. I worked in geriatrics for 31 years. If the caregivers are grabbing hold of your mother's legs instead of cupping her heels and calves in the palms of their hands their technique is incorrect. Caregivers are under a great deal of stress by demands of administrators, supervisors, residents and some families to get their work done as quickly and efficiently as possible and often shortcut technique in favor of speed. Nitrile gloves would be the best to use in my opinion because when you wear them, they feel more like your hands, and you can better feel what is going on with the patient's body. I think they would be able to handle her better and do less damage. I have a different but related problem. I'm a 62 year old paraplegic who can't stand the feel of lotion on my hands. I use the gloves to gently lather moistening lotion on my leg skin to help keep them from tearing because of dryness. Have you considered that your Mom's skin might be tearing due to dryness and brittleness?